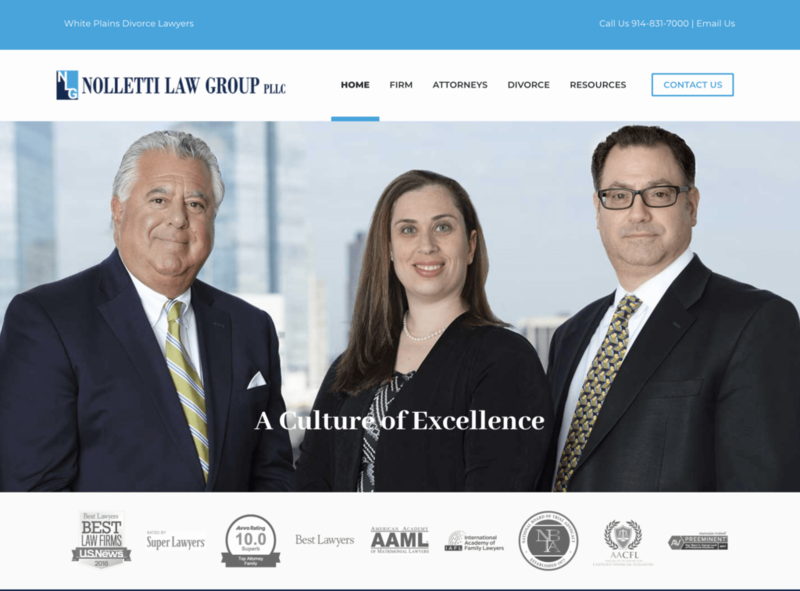 The Nolletti Law Group website needed to be fine-tuned and modernized. The old site missed notating the firm’s prestigious awards, lacked in highlighting the vast expertise of the firm, and was not properly optimized for search engines. Our design team presented an updated, fresh look, adding keywords on important pages of the site. Key awards and certifications are listed front and center on the homepage with the firm’s expertise highlighted through a video and content below. There were numerous technical fixes implemented to improve the performance of the website. Our team included buttons on the video resource page to show more or less videos dependant on the user. The video titles were improved by adding critical keywords for search. We also focused on creating an interactive testimonial segment for the homepage. Information regarding the firm practice areas is presented in a crisp, modern format, drawing viewer’s attention. Clear contact and call-to-action buttons are also present on key pages to direct potential clients to request more information.